It was in Austria. It just wasn't much of a cycling holiday. 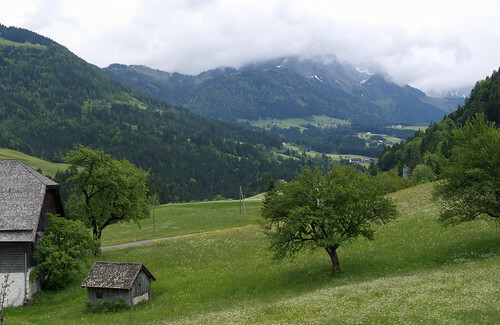 I'd asked the chap in my local bike shop if he'd cycled in Austria and what it was like. Superb, he'd said. Bike paths everywhere, as wide as roads. Then I'd asked our son, who works in Vienna, what the weather was like. Upper twenties, he'd said, and warm in the evenings. So off we went in the van with our bikes inside. Rob (our son) is excused as no-one controls the weather but the chap in the bike shop was talking rubbish, unless the other half of Austria is completely different to the one we were in. I'm going to follow this up next time I need an inner tube urgently. We did ride the bikes. 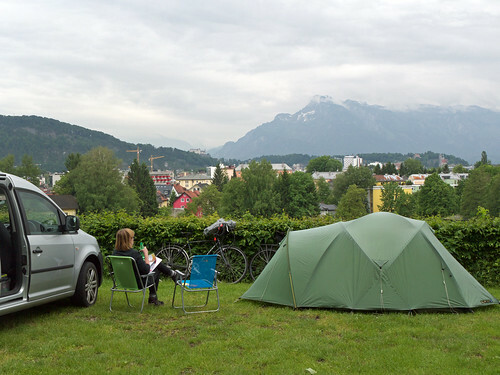 We cycled from our camp site in Salzburg into the centre of the city and back again one evening. If we hadn't cycled by the Rhine near Düsseldorf on the only sunny day since leaving Vienna the week before, that would have been it – one ride. As it happens, Velo-city 2013 is being held in Vienna this June. Apparently, cycling plays a crucial role in the integrated mobility strategy of the city. This is the same sort of nonsense we'd heard in our LBS. The U-Bahn plays a crucial role, plus trams, and cars of course, but not cycling. I was there so I know. There are a few bike paths in some of the grand avenues in the city centre but nothing else. Salzburg is similar. It's easy to tell when cycling plays a role in an integrated mobility strategy: you see bicycles everywhere, like in Amsterdam, Copenhagen, and even in London. You do not see this in Vienna. Not that it matters. Vienna and Salzburg are lovely cities and worth a visit regardless. Austria is worth a visit regardless. 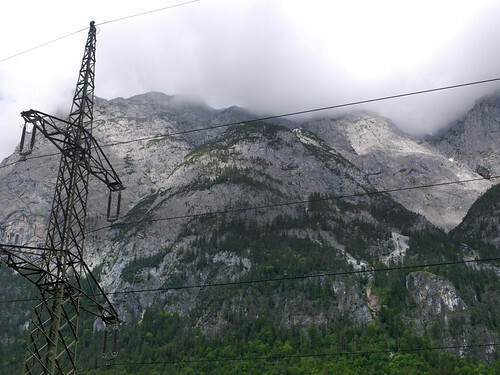 In fact, Austria is stunning, and one of the cleanest places I have ever been. The motorway service stations are incredible. Like Germany, this is a well-run country. And in the mountains there are cyclists riding up the long gorgeous passes, but they are dressed in Lycra for fitness and fun, not integrated mobility. Now, the weather. To be fair to our son, it was warm in Vienna. 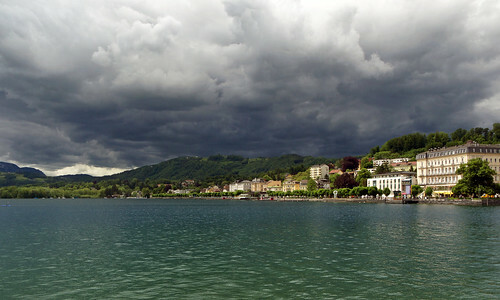 However, during our last evening there, dark clouds began to gather. As we enjoyed our Schnitzels (spaghetti in my case as I don't eat meat) the rain came down and the temperature dropped ten degrees. The following day the forecast was not good: many more days of rain and 10 degrees maximum. We packed everything up and drove some distance to a town called Gmunden by a large lake amongst the mountains, then up a gorge and through tunnels to the village of Hallstatt where there was supposed to be a nice camp site. 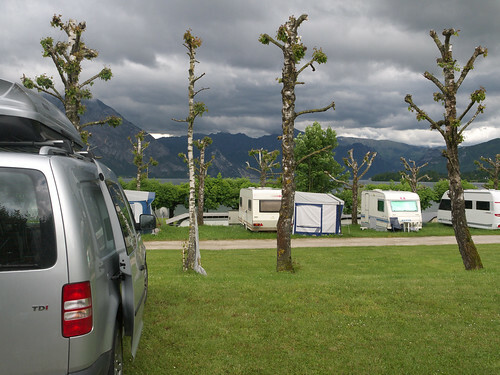 It was so cold that we went back down to Gmunden and camped on a site that was mostly empty, right by the lake. It looked the sort of lake we could cycle round the next day, but the next day was wet and freezing and you can't cycle round that lake anyway so we drove on to Salzburg through a lot more incredible scenery. Salzburg is where we had our one and only bicycle ride in Austria and where, on the camp site, we were next to a cycle tourist from Halifax, England, who'd ridden from Munich airport with the aim of cycling for three weeks up the famous high passes in the mountains. He mentioned a really high one called Glockengross or something. This poor chap, with only his bike – a Ridgeback Panorama like ours – and a tiny tent, was depressed and was thinking of calling the whole thing off. Snow was his worry, not the fact that the mountains were hidden in cloud. I don't know if he gave up. I would have. We did, more or less. Snow was forecast for Innsbruck, our next planned stop. We had fancied we might be able to cycle up to the Eagle's Nest at Obersalzberg in Berchtesgaden (actually in Germany) but discovered you can't. Either way, the mountains were invisible so it seemed pointless to try. 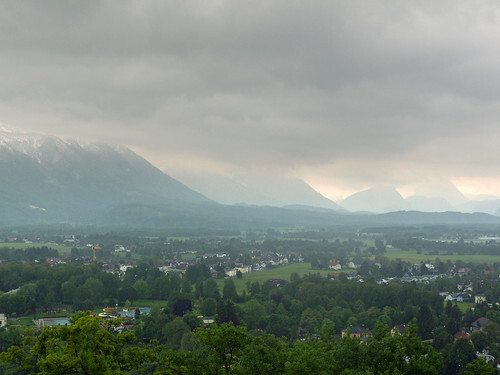 More rain, 8 degrees, a walk around Salzburg, then off again the next day. We phoned some friends in Düsseldorf, Germany, to say we'd be there several days early. Passing through the Black Forest in heavy rain (after a night by the Bodensee) it dropped to 4 degrees. Further south, Stage 19 of the Giro d'Italia was cancelled because of snow and windchill of -20C. How can this be, in the heart of Europe, when the summer solstice is only three weeks away? Is the earth warming? The next couple of days were quite pleasant and we went cycling again, this time near Meerbusch on the west bank of the Rhine where our friends live. The land is flat and in the warm sunshine elderly German ladies were out on their bikes for some exercise and a chat. This is a suburb of Düsseldorf and you can ride along the Rhine itself or through patches of country between the towns of Kreefeld and Kaarst. When the bike paths end you can ride on the pavements, marked out for bicycles with a red brick surface (it's a mystery why there isn't more of this in the UK, as it seems such a simple solution). The bike paths themselves, through fields or alongside busy roads, are shared between cyclists and pedestrians. This is not Holland of course but flatness is condusive to cruising along with no effort so the ladies and gentlemen ride upright city bikes like the Dutch. On the journey to Zeebrugge to catch the overnight ferry our satnav diverted us off the Autobahn near Eindhoven in the Netherlands. The diversion passed through a small Dutch town – Someren, I think, or perhaps Nederweert. Anyway, immediately you enter Holland there are suddenly bicycles everywhere. It's quite amazing. The more I see it the more I am convinced it is to do with flatness. The flatness of Holland (and probably its compactness) is the fundamental reason why there is so much cycling. It means elderly people can ride bicycles without needing to dress up, or even be fit. Inclusiveness matters in an integrated mobility strategy. Our 'cycling' holiday should have been 16th May to 4th June but we arrived home several days early. Even now when we'd still have been away the weather in Salzburg is 8 degrees max and heavy rain, and has been most of the week. So we had done the obvious thing. Had we been cycle touring in Denmark (as we originally intended) things might have been better, or perhaps not (we wouldn't have seen our son), but with B&Bs booked we'd have had to press on regardless. The bike van idea means we can move with the weather. I'm not sure if that is a good thing or not but it's nice today in the north of England and we're going cycling! Posted by Patrick on June 2nd, 2013. That is such a shame Patrick. A holiday that well... wasn't. I must admit mind you, that your photographs really captured the atmosphere of the weather. They almost look 3D! Its been really hard organising holidays the past 12 months due to weather. And I must admit, it is only now, the last week of May and into the first week of June that our local weather is starting to look kindly to us. March and April we had 10 feet of snow! Yep, on the island. Smothered we were. I was surprised to read other parts of Europe too were obviously colder than they should be, and/or wetter. The Vienna scenery looks splendid, what a pity it was a 'not for cycling' part of the world because it certainly looks beautiful. I felt a bit mean showing that English cycle tourist the long range forecast but it was the truth. Meanwhile the UK is in for a pretty fine week (should be good for the IoM TT). I'm keeping my fingers crossed for good weather in France! Or at least better than you got. Its such a shame when you get such miserable weather and it did seem as though much of Europe was affected. One wet Friday I decided to treat myself to watching a mountain stage of the Giro on the computer only to find the entire stage had been cancelled because of snow. The weather so far this year has been very strange. Mary is right, they are great photos. It seems to be wet and miserable everywhere. And windy. So far our own plans are to leave from our front door and ride where somewhere, anywhere. Destinations are still to be determined. No-one controls weather. I had one nightmare tour in 1993 or so when it absolutely bucketed rain all-day long on 6 of nine days in the Pyrenees/South of France. I hated that holiday. We had two days of snow, sandwiched by 28C on a tour of Bavaria years ago. On the worst summer ever in England with floods in Gloucester etc., we had a sunny tour in Scotland.. I'm suprised by your bikeless experience in Vienna. I rode into Vienna two years ago alongside the Danube. The bike path takes you directly into the city centre. It was busy when we arrived in sunny weather and we had to queue to cross intersections. They had a bicycle traffic light set up to give priority over cars. When the lights were at red we were enclosed ina sea of utility bike riders waiting for the lights to turn green. All ages were on bikes and it reminded me of Copenhagen by the sheer weight of cyclists in the city. Maybe it was the bad weather. Hi Jim. Vienna wasn't actually bikeless. The weather was nice the three days we were there but there were no more cyclists than in, say, Manchester, and nothing to compare with London. Generally the streets don't have bike paths though as I mentioned, there are some prominent bike paths with cyclists on them in the big streets right in the centre (I didn't take any photos and I see that Google Streetview has not yet come to Vienna). It is stretching things, I think, to describe Vienna as a cycling city, especially compared to Copenhagen or Amsterdam where you can barely move for bicycles. It seemed like any other European city to me – a few cylists but mostly either cars or public transport. Jim wrote: ... I rode into Vienna two years ago. It's a long way. Further east than I thought it was. Further than Slovenia for example. Grossglockner, Patrick. That, the Stelvio, St. Bernard, and as many other alpine passes as I can find are on my definite list (for reasons which will not surprise you!) But though their climbs may be many times more epic than anything in the UK, the weather may end up being even more mixed (in both the senses of 'rapidly changeable' and 'extreme'.) I would rather be on a UK hill, as long, high or remote as it may be, than on a 20-30km climb (or freezing, wet, icy or brakes-finger-numbing descent) when the weather suddenly turns its fury on you. As far as global warming is concerned – a change in the stability of the weather is the first sign that something is changing! For such a dynamic system as the global climate, local warming shouldn't be expected too much of the time. Alterations to patterns, less-predictable conditions in fairly benign climes, and bigger troughs and peaks in the general scale of the weather (temperature, windspeed and rainfall max and minima), are all things that I think we need to be expecting in the coming decades. Any of this sound familiar? Believe it or not, still jealous of your trip though.. 😀 a chance to see the Alps by bike is something I've been promising myself for an age! But cheers for the insights. I think a flexible schedule and itinerary would pay great dividends in a similar situation. I may well revisit this blog. Well, yes. Highly recommended. Go for it. Unfortunately we didn't!